Over fortyfive leading companies in the shipping and offshore maritime sector are among those who have contributed to the funding for the first ever exhibition in the Netherlands dedicated to the offshore sector, to be housed at The Maritime Museum Rotterdam for the next seven years. Offshore Experience, which will open in mid-December, will provide visitors a spectacular overview of the search for oil, gas, windenergy and renewables at sea. Visitors to Offshore Experience can experience what it is like to work at sea, perhaps even 3 km below the surface. People of all ages will be able to embark on a challenging search at sea for energy. Wearing a safety vest and helmet, they will experience what it is like to be on an offshore construction in the middle of the sea. 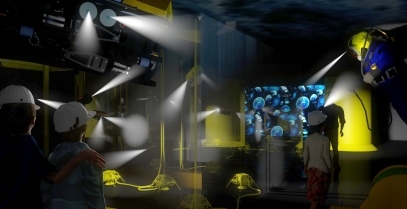 A 360° film projection stimulates the senses. Ships come and go and helicopters land. Models of the newest and most advanced offshore ships will demonstrate their capabilities. 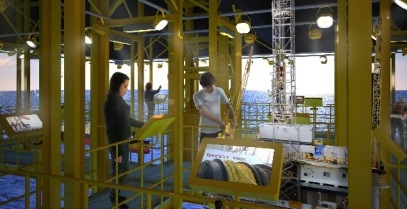 Offshore employees will offer a glimpse into their lives at sea, and simulated presentations will enable visitors to experience for themselves how drillers, crane drivers, wind turbine specialists and helicopter pilots undertake their demanding tasks on the open sea, in a constant battle with the elements. 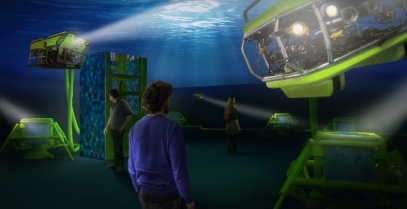 A lift will take visitors down to a mysterious undersea world, from just below the surface to a depth of 3 km. The adventure ends in the future, as visitors vote for the best sustainable idea for producing energy at sea. As well as developing the exhibition, the museum is also expanding the limits of Holland’s maritime heritage by adding offshore to its collection policy. It is carrying out extensive research into the history of the offshore sector in collaboration with Erasmus University and setting an innovative course in terms of technology education and project-funding. 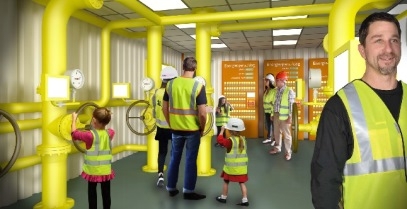 The Offshore Experience can also be programmed as an educational location for primary, secondary and vocational education. The exhibition is the basis of a new technology education programme in the museum which is in line with the National Technology Pact 2020. This is an agreement under which the Netherlands government and social partners are setting out a long-term approach for increasing the numbers of technically skilled professionals. Seaway Heavy Lifting, Tideway B.V., Oranje-Nassau Energie B.V., Teijin Aramid BV, Saab Seaeye Ltd., JB Systems, MARIN, Jumbo, Iemants N.V. , Peterson, ENGIE E&P Nederland B.V., HSM Offshore BV, GustoMSC B.V., TOS Netherlands B.V., STC-Group, Navingo B.V., Vroon B.V., Van Beest B.V, Falck, Volker Staal en Funderingen B.V., RedWave BV, Gunneman Group IMO, Hydac BV, Sif Group BV, Nature group, InterDam B.V., Primo Marine, RH Marine Netherlands B.V., International Paint (Nederland) BV onderdeel van AkzoNobel, Intramar Insurances, Scheepvaartkrant, Halliburton BV, Bureau Veritas Marine Netherlands, AncoferWaldram Steelplates bv, Koninklijke Niestern Sander Scheepsbouw B.V., Stemat bv, Fugro N.V., IHC Hytec BV, Rederij Groen, Seascape BV, TNO, Ulstein Design & Solutions B.V.
BankGiro Loterij, Mondriaan Fonds, Stichting VSBfonds, Stichting Bevordering van Volkskracht, Stichting Zabawas, Prins Bernhard Cultuurfonds, Stichting Ondersteuningsfonds N.I.S.S., Vaderlandsch Fonds ter Aanmoediging van 's-Lands Zeedienst, Van Cappellen Stichting, G.Ph. Verhagen-Stichting, Erasmusstichting, Stichting Swart-van Essen, Directie der Oostersche Handel en Rederijen, Dorus Rijkers Fonds, Stichting Job Dura Fonds, Janivo Stichting, Stichting Doelwijk, Van der Mandele Stichting, M.A.O.C. Gravin van Bylandt Stichting, STOER, Stichting Physico Therapeutisch Instituut, Rotterdamse Stichting Blindenbelangen, Stichting Blindenhulp, Landelijke Stichting voor Blinden en Slechtzienden. Download high resoltion press photos.